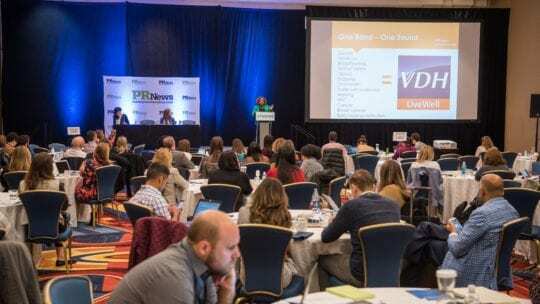 More than 150 social media marketers, communicators and PR pros attended the summit at the Baltimore Marriott Waterfront on Oct. 23 to hear from some of the industry’s top social media, marketing and communications pros for PR News’ first Healthcare Social Media Summit. Using social media to build trust with customers and patients and the best practices and tools to monitor that progress were the primary themes of the day, which began with a session on the state of healthcare communications featuring Kieran Fagan, vice president of communications at Aetna and Susan Isenberg, Edelman’s global sector chair, health. The public’s trust has fallen to such a low when it comes to healthcare reporting, that it now views healthcare companies as a more credible source than the media, Isenberg said. She was citing her firm’s annual trust and credibility online survey, Edelman Trust Barometer, which has tracked the public’s view of the healthcare industry across 25 markets for the past 18 years. This puts healthcare companies in the optimal position of building relationships with their patients, many of whom seek information about their conditions and community through social channels. How health insurance giant Aetna does that is by finding people who want to talk and tell their stories, said Fagan. Key to this approach is understanding “who your audience is and what channels they’re looking at,” then activating those channels, Isenberg said. At Aetna, they tapped their own employees to tell their stories. Building a policy that provides guidelines for employee engagement in their employers’ social campaigns allows you to activate them to use these channels and connect with customers as well. When it comes to reporting your healthcare content for executives, think relevancy over data reporting, said Emily Shirden, a partner at agency Finn Partners, who joined Linda Wharton Boyd, DC Health Benefit Exchange Authority’s communications, external affairs and stakeholder engagement director; and Tina Starkey, national director at the American Cancer Society, to discuss the best way to measure successful content for the C-suite. The discussion was moderated by Robert Oquendo, executive vice president of digital and creative for Spectrum. “Data is only valuable if you do something with it,” she said. “You can evolve how you’re looking at data, what data you’re looking at,” she said. Don’t indulge in a “set it and forget it” mindset. “It’s about knowing your audience and what you’re trying to get them to do,” she said. Panelists agreed that winning on social is knowing when not to be on a particular channel if it doesn’t make sense for your brand. They also touched on the risks of social in general for organizations that have a centralized and decentralized function—national channels and channels managed by local satellites. The risk is worth it, Starkey said, it just needs to be managed. For social media experts looking to increase stakeholder engagement, Tyler Pennock, Zeno Group’s senior vice president of healthcare digital encouraged attendees to consider influencer marketing. He was on the panel with Dominick Kennerson, head of pharma health policy region Americas at Bayer. 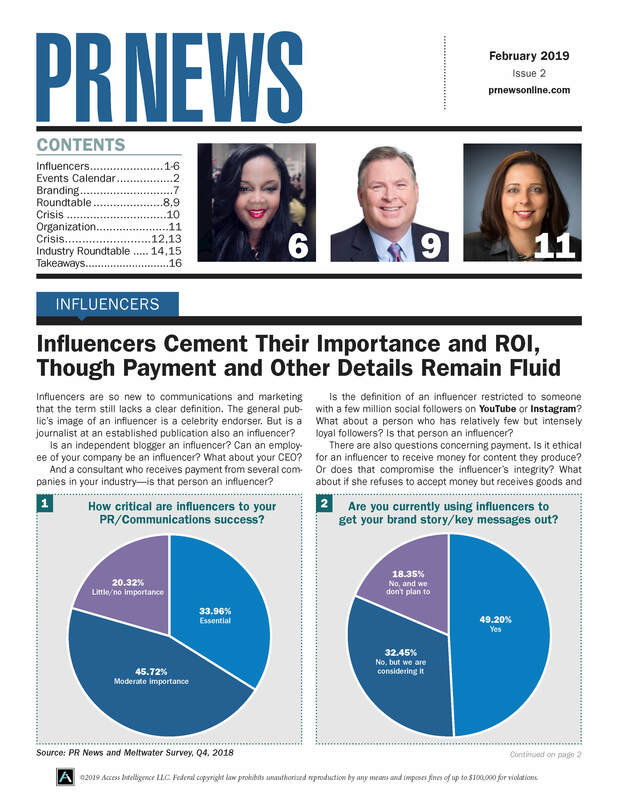 Pennock said he’s seeing greater ROI as more brands work with influencers more frequently, even on channels that they thought may not be a good fit for their brand, such as the visually rich Instagram. “If you’re thinking it’s not an environment for us, [you] need to rethink that,” he said. While it may not be appropriate for your brand to create that channel, it may be for influencers who know how to navigate it effectively and understand the types of relationships they can pursue. In the session, “How to Use Social to Prevent (or Mitigate) a Crisis for Your Healthcare Brand or Nonprofit,” Taya Jarman, communications director for the Virginia Department of Health, shared with attendees how she managed to tame a government agency whose social media—with more than 35 different channels—and overall marketing strategy was so decentralized that some channel managers had posted photos of themselves with their children as the face of the agency. There was no consistency in messaging or branding, essentially a social media free-for-all. Jarman saw only one solution: to stop all existing outreach and force all communication from a single brand. It was a risk that paid off. After a content audit, she removed superfluous accounts, redirected pages and refurbished others into Freedom of Information Act compliant platforms, an important consideration for government agencies. Throughout, Jarman and her team communicated regularly with their audiences, including leadership stakeholders, managing expectations along the way. Ensure you are monitoring your social spaces 24/7/365 in order to alert to issues and trigger your crisis plan quickly. The Summit also featured PR News Healthcare Communications Awards, which recognized the most innovative and creative marketing and communications campaigns agencies and healthcare organizations over the past year across 18 categories. See the winners and honorable mentions here. Keynoting the awards ceremony was Shannon Hartley, chief marketing and program officer of Shatterproof, a nonprofit organization that acts as an advocate for people with addictions and their families. You can launch an online community with a marketing campaign, Young said, but you can’t sustain one with it. She knows firsthand. Young launched the Mayo Clinic Connect online community which started off well when the number of registrations far exceeded their expectations. That included making sure members received answers when they asked questions about their diseases or symptoms. It also includes scheduled chats with doctors and other professionals that they may not otherwise be able to see or afford, further increasing the value of community membership. Young was talking with John Novack, the communications director at Inspire, who also has experience in moderating online communities. The pair met on Twitter years ago, when the platform was still in its nascency, and recreated on stage the type of dialogue they’ve had for years, often over social. It’s hard to measure, but the emotional support online communities provide to people who live with the stigma of certain diseases changes lives, he said. One barometer of success is when the online community begins to moderate itself. “When they say, ‘Hey moderator, get out of here,’ that’s kind of when you know you’ve won,” he said. Also on the agenda was David Brooks, senior vice president of digital and social health at Rudder Finn, who shared with attendees best practices for leveraging animations in your content strategy and using demographic data and social listening to make informed decisions on Facebook content. Eric D. Wheeler, the content engagement manager with the NEJM Group, shared how a seemingly sleepy editorial in the pages of the New England Journal of Medicine went viral and coined a new term: “research parasite.” Instead of reacting negatively, the Journal used the attention to position itself as a thought leader in data sharing. That wouldn’t have happened if the team didn’t “hit pause and monitor the conversation” first, Wheeler said. They assessed what was positive, negative and neutral, which allowed them to craft a strategy before responding. Rounding out the day was Suzanne Barston, manager of corporate journalism at Abbvie, a pharma company that used social media to win big in earned media. She said that those looking for journalist’s attention, go to Twitter. “It’s the only place they’re looking with journalist hats on,” she said.